​You are an important person in your child’s life. No one can ever take your place. Your relationship is like no other. Whether you are the mother or father (through birth, adoption, or foster care), a grandparent, partner, family friend, aunt or uncle with parenting responsibilities, what you say and do in your role as a parent matters. The relationship that you build today can positively influence all areas of your child’s life-long development and learning. What does it take to be a successful parent? There is no roadmap or simple answer. It’s up to you to find your own style and discover how best to relate to your unique child. There are many ways to parent well. This Parent Guide can help you find your way. 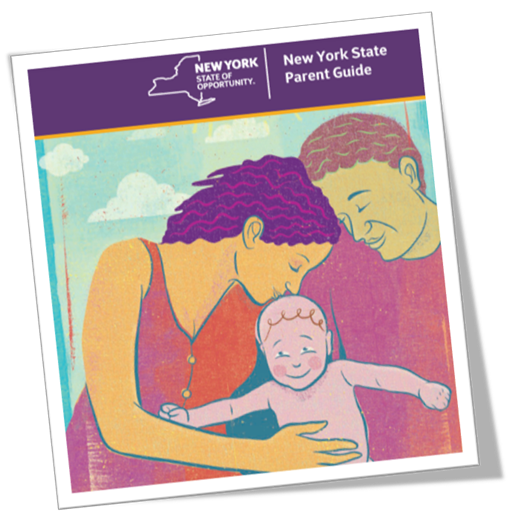 In this Guide, we refer to any adult in the parenting role as “parent”. When talking about the child, she and he are both used in this Guide. You can use the ideas you read about with both girls and boys. What this Guide is... and what it isn’t. There are many books and articles about teaching your child to sleep, eat, use the toilet and behave. This Guide is different. It is all about you and what you can do and say to grow a positive relationship with your child, using five key parenting behaviors. This Guide provides many resources you can turn to for support. We know you work hard to keep your family strong. The Guide also encourages you to write down thoughts, ideas and memories as your child grows. So that one day, you and your child can reminisce together. Using the code below, your organization’s web master can imbed the left image on your site and have it direct users to the NYS Parent Guide Website.